After the ribs dry out, it's time to fair them all. The process of bending them around what is essentially a cone shape, results in a number of small irregularities of the outer faces. These all need to be evened out for the planking to run smooth. Customers don't seem to like bumpy boats. 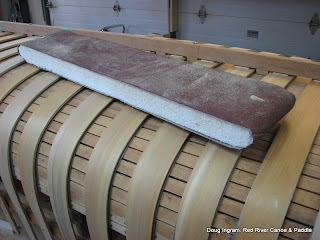 I used to use commercial long sanding blocks, but was never satisfied with their performance. Now I use a 6" wide belt sander, coarse grit, belt with a piece of Styrofoam shaped to fit tightly inside. Rub this over the ribs and they get nice and smooth. Prior to planking, I'll need to apply some boiled linseed oil to the rib faces.